Hello everyone! My name is Kayla Copus and I am an incoming third-year Agricultural Communications major with a minor in Agribusiness, from Merced, CA. For the past year, I have had the wonderful opportunity to work as the Communications Intern for CalAgJobs, a company that connects employers and job seekers in California agriculture. Having a year-long internship is rare, however, this experience has taught me so many of the skills needed by an agricultural communicator. While CalAgJobs is located in Orland, CA, I am able to work remotely during the school year, using a computer to complete my daily responsibilities and other tasks given to me. Having an internship with CalAgJobs that continues during the school year can be stressful at busy times, however, I know that I am better for it because it has allowed me to take the skills I have learned in two years of classes at Cal Poly and apply them immediately in real-life situations. As the Communications Intern, one of my main responsibilities is assisting to manage the CalAgJobs Facebook Page. I check the CalAgJobs website daily for new job and internship listings to post and advertise to our Facebook following. I also search for online agriculture articles that are relevant to our following and post those as well. As CalAgJobs’ first intern, I started a blog on their website that is geared toward college students and young professionals looking to enter the agriculture industry. To get content and add credibility to the blog, I interview career and industry professionals in agriculture. The people I have interviewed range from Marketing Directors, Fair Managers, and Agriculture Career Counselors. As former interns and current agriculture professionals, these interviewees offer information, inspiration, and advice to our readers about internships and careers in agriculture. Other tasks that I perform include writing press releases, designing agricultural or inspirational memes for social media use, and sending outreach emails and postcards to potential clients who are looking to fill job or internship roles in California agriculture. One of the most rewarding aspects of my internship is participating in special projects and attending agriculture events. For National FFA Week, I assisted in the research of the 400+ crops grown in California to be featured on the “We Grow It All in California” t-shirt that I then helped to sell at World Ag Expo. I was also able to attend California State FFA Convention where I helped at the FFA Alumni Reception and the CalAgJobs booth at the career fair. These experiences have helped me develop my oral communication and agriculture advocacy skills that I don’t usually exercise every day. 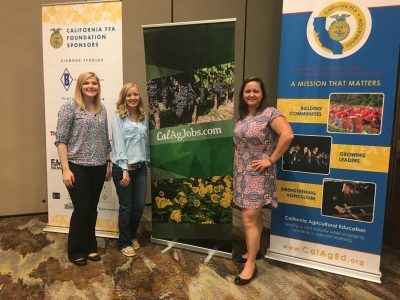 Left to right: Miranda Driver, Kayla Copus and Shannon Douglass of CalAgJobs at the CA FFA Alumni event in 2017. Thankfully, I have an internship that has developed both what I know and who I know, to carry me into my future career in agricultural communications.